When I went to the Sewing Summit last October, one of the classes, Photographing Your Creations – Simple Changes for Maximum Impact was taught by Vanessa Christenson of V and Co. Anyway, she had some great tips and out of respect for her and her time, I won't go over everything here. I suspect she's posting them on her own blog here and there. I do want to give you a brief glimpse, though, of her process for taking photographs and which I found to be helpful. 1) Take a lot of pictures just to get a few good ones. Now this I already did but it was nice to not feel I was insane for taking 30 photos of one quilt just to post 3. 2) Use good lighting. Natural light, filtered is best. An open west facing window in the afternoon or outdoors in the morning or evening. Flashes wash out color and only highlight a center spot while indoor lighting is often too yellow-ish in the photo. 3) Staging. Display your quilt in various scenes to set the mood you want for the quilt. 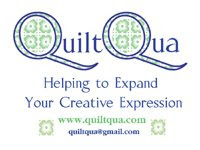 Yep, you want your quilt to evoke a mood. For example, if you are photographing a baby quilt, why not put it on the floor with baby toys around/on it. The following is a photo I posted immediately after the Summit. I loved the way it came out but I took about 12 photos to this one that I didn't like. This one wasn't my creation but I wanted to showcase the colors in this mini quilt and placed it against a bush whose leaves had changed. I've just completed this quilt for my sisters for their table. I love the beautiful Samoan fabrics and the background fabric is a mottled tan which looks like sand. I couldn't help but quilt waves into it once it all came together. I initially thought I wanted to show it as it is meant to be, a tablecloth. Or maybe show it near the table for perspective. First shot but the flash went off. Further back but it doesn't show any detail and I don't like it hanging over the chairs after all. How about on the table itself. Oops, lighting. A different angle helps grab the sunlight but doesn't show the quilt well. Another two slight perspective shifts. I should do a couple shots outdoors just to see what I come up with. I have some flowers let me try with those. Then again, I haven't planted them yet and I don't want to show the buckets from the store. Not enough flowers in the last, let me try this... maybe I can crop out the buckets. Change in perspective again and again. Eh, not feeling it. Maybe over the fence? If I put it over the gate, an arch look could work. I look to my left and see the tree hanging over the fence rail in the corner. Maybe this is a good idea. Drape it over the fence. I don't like I can see the ground, though and it might be too shadowy on the big screen. A more straight on shot. I wonder if I could drape it nicely? Nope, I don't like the drape. Let me stop here and see how they look on the computer. I did that and was pleased to find a couple I really liked (see the grouping over the fence with the tree draping over it). I chose one I liked best and decided whether to edit for brightness, cropping, etc. but this one I left as is. I didn't like the the way it looked once cropped, it became blurry. So what's the point, you may ask? Well, for me, the point is to keep the finished products interesting and intriguing. To finish off the entire project with a little flair, so to speak. It's a personal preference and I enjoy the last little effort to finishing it this way. Now, I am almost bummed if I don't get the opportunity to play with the photos and quilt a bit. I hope you've enjoyed my peek into my brain and maybe, you've become inspired to play around with setting scenes in photographing your own creations, whether quilts, handbags or whatever. Oh how I love those Samoan fabrics. I was told by a very dear friend that you have to take alot of photos to get one good one. I love the colours and design of this quilt. I know I'm crap at taking photos, I don't have anyone to hold the quilts up. The lighting in my house isn't great and my fences are not fit for draping on. In fact I never want any photo of my garden, its too shameful. Thanks for sharing the though process though. I enjoyed this post not least because now I know that I am not the only one who takes 30 shots to get one decent photo! I also love the quilt, great colours and great design. I take a ton of shots to get my eventually used mediocre ones, but your post is timely because I've been thinking lately about getting more creative with my photos. Great tips! I just take a picture so I have a record of the quilt. I like your idea of one final bit of creativity in your photography. I now have a nice little camera. I will have to try some different scenes to get nicer picture. Thanks for your post. Thanks for a great post. I too take so many shots of my quilts. Your quilt is beautiful! Hope to run into you at SS this year. Great tips. Hubby was laughing at me the other day when I was outside taking pic after pic of a quilt lol. I love that I am not the only crazy ond to take a bahillion pictures. Thank goodness for digital cameras! !